This week we’re shining the Meet The Band spotlight on the Atlanta band Avail The Lost, whose debut EP is Heavy Hearts. 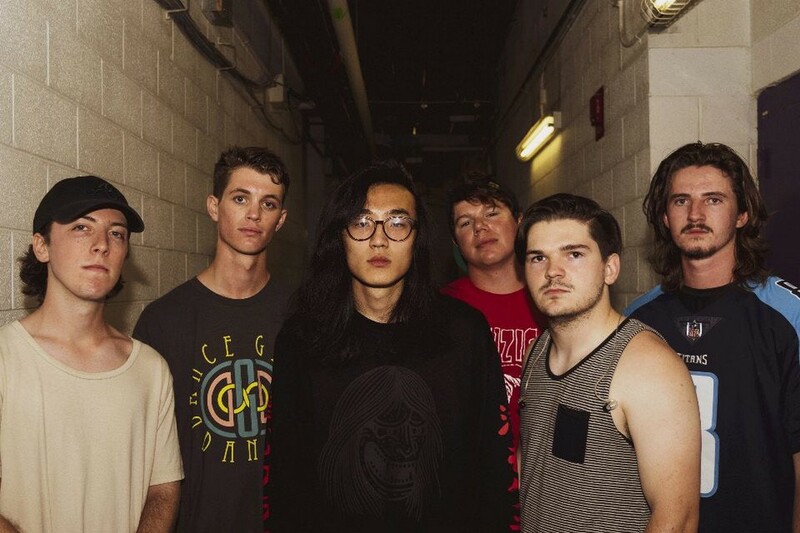 Guitarist/vocalist Tristan Trust, vocalist Brian Ra, drummer Carson Goodwin, guitarist Eric Fitz, bassist Chris Worrel and guitarist Mitchell Martin introduce us to their band. Chad Bowar: Give us a brief history of Avail The Lost. Avail The Lost: It all began in a college apartment with roommates Tristan Trust (guitar/vocals) and Mitchell Martin (guitar) wanting to form a band. They reached out to former teammates and friends to find Eric Fitz (guitar), Carson Goodwin (drums), and Chris Worrel (bass). Brian Ra (vocals) was then found through Facebook. They began practicing together as a full band at a local church in Kennesaw, GA in April of 2017, forming a close bond with each other and spending many days and late nights working to write and perform their debut EP titled Heavy Hearts. How would you characterize the band’s style/sound? Avail the Lost is still trying to find our “sound.” We have a lot of influences ranging from classic rock to more modern metalcore. Our combined spectrum as a band helped each of us learn to open our minds to other influences which, when put together, our listeners will hopefully be able to hear each style in our songs, especially in albums to come. You released an EP in 2017. What’s that status of your next release? We are writing our next project currently, but we will have a single coming out very soon. We also are planning to make a couple very important announcements in the near future. Keep watching for us, it’s going to be a ride you’ll want to join. What are your goals and aspirations as a band? To have fun making music we love that will transpose our passion and emotions that provides music to people who need a way of expressing themselves and hopefully they can connect with us. Our long term goal is to tour and keep trying to reach concert goers from around the world. Passion in music can generally be felt globally, it’s just awesome to say that something we wrote can make people feel a type of way. Opening for Palisades and Dayseeker at The Masquerade in 2018. Joining these two bands for the Atlanta concert in their tour was an amazing experience (Brian our vocalist actually saw them live back in 2014). Both of these bands are made up of an incredible group of people, and we learned so much from talking and hanging out with them. Another cool thing about making music is you meet like-minded people from all over the place; it can be intimidating as well as inspiring to know there is a place for us. We are playing a show on March 17th with VRSTY, Levels, and Glass Hands. Then on May 9th we will be sharing the stage with Secrets, Awaken I Am, and our friends in Shot Down South. Each one of us has a different story. Tristan began learning guitar 14 years ago and quickly built interest in rock and metal, specifically classic rock bands. Avenged Sevenfold, and Metallica at the time encouraged him to grow as a musician and eventually to be in a band himself. Mitchell started playing guitar at age 10 due to the influence of his grandfather then had stopped for awhile. He picked it back up again after his grandfather passed a few years ago. Chris began playing bass after forming a short-lived band in high school mostly centered around classic rock bands such as Led Zeppelin, Motley Crue, Def Leppard, and Scorpions. Eric started playing the piano at 7 years old then branching to play flute in the his middle school orchestra before finally taking up guitar at 13 years old and has since been trying to surround himself with as many genres and playing styles as possible. Hard to say what he is currently listening to it varies from day to day from Staind to Justin Timberlake then to Wage War. Brian got into singing/screaming when he was a pizza delivery driver and would practice while on delivery runs. He originally wanted to be a guitarist, and has liked metal/metalcore ever since he heard CM Punk’s theme song “This Fire Burns” by Killswitch Engage. Carson has been playing drums since he was a kid after listening to his favorite band Oh, Sleeper and has never stopped since. Our biggest influences when we were first starting out included Crown The Empire, Avenged Sevenfold, Oh, Sleeper, and Asking Alexandria. Currently we have added major influence from Architects, Ice Nine Kills, and some others artists outside of metalcore such as MF Doom. How’s the metal scene in Atlanta these days? Any other bands from there we should know about? There are a bunch of great bands coming out of Atlanta. Our friends in Ghost of Evergreen, Void Eater, and a new band Atlus are all amazing at what they do. There’s a new wave of young bands that have came out in the last year or so. There’s so much potential building up in Atlanta and it won’t be long before we all blow up. Watch out. We all love horror movies. Hereditary and Bohemian Rhapsody (not a horror film haha) were pretty good. While not a movie, The Haunting at Hill House is a phenomenal show. Architects – Holy Hell, Underoath – Erase Me, Vein and Turnstile’s new albums must be played at least once a day for Brian to remain human! We invite you to follow us on Instagram and to like our Facebook page to keep up to date with us and to chat whenever. Expect a new single with a music video, and a new record to be released this year.